Funky Thunder Stuff: Joy Division! I recently had the opportunity to watch the Joy Division documentary, along with the autobiographical movie of their lives, Control. Both are epic! Joy Division was an English band formed in 1976 in Salford, Manchester. The band consisted of Ian Curtis (vocals and occasional guitar), Bernard Sumner (guitar and keyboards),Peter Hook (bass guitar and backing vocals) and Stephen Morris (drums and percussion). 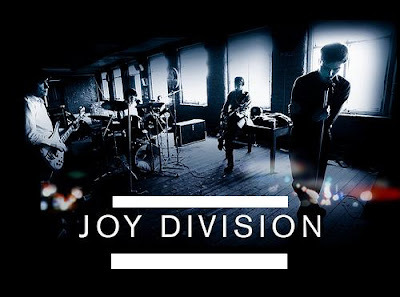 Joy Division rapidly evolved from their initial punk rock influences, to develop a sound and style that pioneered the post-punk movement of the late 1970s. Their self-released 1978 debut EP, An Ideal for Living, caught the attention of the Manchester television personality Tony Wilson. Joy Division's debut album, Unknown Pleasures, was released in 1979 on Wilson's independent record label Factory Records, and drew critical acclaim from the British press. Despite the band's growing success, vocalist Ian Curtis was beset with depression and personal difficulties, including a dissolving marriage and his diagnosis with epilepsy. Curtis found it increasingly difficult to perform at live concerts, and often had seizures during performances. In May 1980, on the eve of the band's first American tour, Curtis, overwhelmed with depression, committed suicide. Joy Division's posthumously released second album, Closer (1980), and the single "Love Will Tear Us Apart" became the band's highest charting releases. After the death of Curtis, the remaining members reformed as "New Order".